Student nursing is a weird and wonderful journey that can take us to many unexpected places, but I never thought I would be dressing wounds from a car boot in the middle of a refugee camp. I have always wanted to incorporate humanitarian volunteering into my nursing career, so when I heard a podcast about the continuing need for aid in Calais I decided to help. I started searching online, and a few emails later I was directed to the First Aid Support Team (FAST). 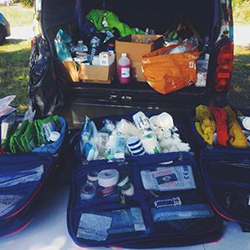 The group comprises healthcare professionals and support staff from the UK, Belgium and the Netherlands, who volunteer to assist refugees around Europe, operating as a mobile triage unit. The team doesn’t prescribe or administer anything stronger than paracetamol, and wound dressing is the most common procedure. We also carried out tasks such as respiratory assessments and manual and neurological observations, and would call an ambulance if someone’s condition was potentially life-threatening. I went to Calais on 13 August and stayed for a week, working alongside a fellow nursing student, an ex-army paramedic, a junior doctor, two medical students and a driver who had a wealth of first aid knowledge. Between us we worked collaboratively, trading skills in dressings and diagnosis to improve our practice. It was one of the most unified teams I ever have worked with. Physically, we dealt with everything from scabies and nits to infected insect bites and trench foot. We also diagnosed chest infections and pneumonia. Many of the refugees had mental health issues and we treated multiple wounds caused by suicide attempts, as well as those due to violent altercations with the authorities, such as tear gas rash or dog bites. 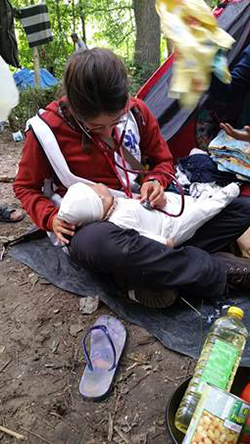 Nursing in a refugee camp is unlike anything I could have imagined. The living conditions are inhumane, with hundreds of people, including families with babies and young children, living in small tents. You would often find two whole families living in a six-person tent, with some people under tarpaulins strung up between trees. There were two portable toilets– which were highly unsanitary – for everyone in the camp, and no showers. Water from a small stream running through the camp was used for washing and cooking and for the toilets, and many people had diarrhoea. It is a tragedy that people were forced to drink the same water that was causing them to have diarrhoea. Athlete’s foot was another common problem, and there was also a high risk of contracting sepsis. 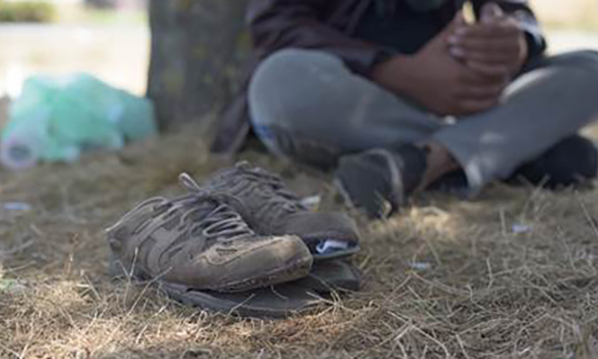 The refugees were forced to be on the move daily, with many not having the right size shoes. Blisters caused by this could easily become infected. Infants were not vaccinated, and there were reports of children dying simply from catching flu. Women could not access basic contraceptive protection or sanitary items, and were at risk of sexual abuse. Some of the babies born in the camp were the product of sexual assaults. The lack of disposal services meant the waste in the camp attracted numerous insects, contributing to the spread of disease. For those used to stringent infection control practices in the UK it was shocking. Since I returned from Calais I have been asked how the experience has changed my nursing practice. But it is bigger than that, it has changed me. What I saw really shook me, opening my eyes to the suffering of refugees. This experience made me thankful for what we have in the NHS. We can all be guilty of complaining about stock levels and not having enough of something, but volunteering in Calais taught me that we are nurses, and our skill set is not reliant on products or the right size of dressing. When you have dressed 22 open infected sores by the side of a car with your knees as your sterile field, you realise what you can achieve with very little. This experience has increased my confidence as a nursing student, showing me what I am capable of in difficult conditions. If you can walk into the worst place on earth and show compassion and humanity, and make someone laugh while dressing an incredibly painful wound, having the wrong size of bandage pales into insignificance. There are many reasons why people flee their home countries. You don’t have to agree with them all, but you can show compassion for the suffering of a fellow human being.